Ducati motorcycles started in 1926 with their Italian roots. The company was founded by the Cavalieri Ducati brothers. Originally, Ducati focus was on components for radio transmissions. That would pave the way to expanding into other areas, such as racing motorcycles. In 1946, the Cucciolo was developed, a small motor for bicycles. From there it was developed into a miniature motorcycle. From these early roots, Ducati laid the foundation of what the Ducati motorcycle brand would become. Today, Ducati motorcycles are known for their sleek designs and racing prowess. When it comes to professional racing, Ducati is the standard others are compared too. While Ducati is known for its racing abilities, Ducati offers quite a large selection of bikes for all types of riders. In addition, they offer models such as the Diavel, Hypermotard, Monster, Multistrada, Multistrada, Superbike and Supersport. The Diavel models are more of a cruiser type bike. These bikes offer max comfort for cruising the countryside. The Hypermotard bike is part of the 939 family and more of a dirt bike inspired bike. The Monster models are an entry level type bike for all new riders. Another great model for cruising with extra storage on the bike is the Multistrada bikes. The Superbike and the Supersport are more for the rider that enjoys to race and have a little more power with their bikes. 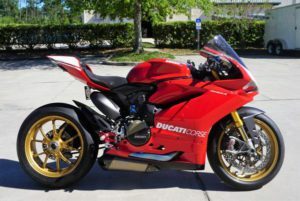 At Sell Us Your Bike we buy all types of Ducati motorcycles. 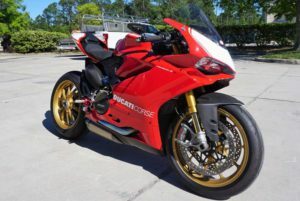 Fro example, we recently purchased a 2016 Panigale R Ducati Race bike recently purchased in Zephyrhills Florida with race exhaust and bolt ons only had 100 miles! With great design and sleek look, a Ducati motorcycle is always in high demand. We purchase Ducatis in good shape from the year 2002 and up. Also, we buy from all over, including areas in Florida, and throughout the south. In addition, we have bought bikes from Miami, Orlando, South Beach, Daytona and many other Florida cities. To start the selling process fill out our quote form. Once we receive your submission, we will contact you with a great offer. Then once the price is agreed upon, we will arrange to pick up of the bike and issue you a check. Finally, sell your Ducati today for the money you deserve.